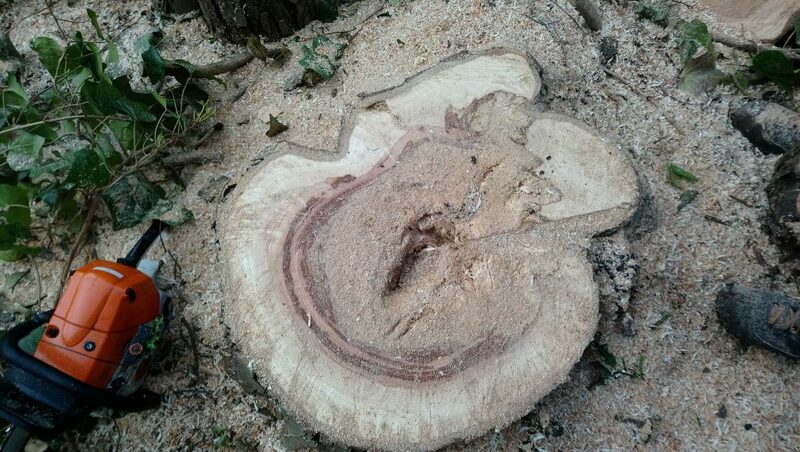 The decision was made to remove this tree and a Nothofagus solandri due to the extent of the decay caused by fungi Ganoderma and an increased risk of failure. The tree has been growing in the Garden for 62 years and the Ganoderma fruiting body was first observed in 2007. I believe it to be either Ganoderma applanatum or australae but identification based on morphological characteristics alone can be unreliable and we treat the significance of Ganoderma applanatum and G.australae decay as the same. Research does highlight differences in decay strategies but is not extensive enough to inform different management decisions for the decay caused by the two species and we recognise that the species of tree will also greatly influence the rate of decay. The image bellow shows the extent of decay that was revealed once the tree was cut down. This will hopefully be of interest to others who find Ganoderma fungi fruiting bodies growing from Nothofagus betuloides. It is interesting to see how where the fruiting bodies emerge from the trunk is connected to the decayed wood, the mycelium of the fungi has clearly colonised and killed live tissue. It is important to note that many factors will influence the rate of decay including the genetics of the fungi and the tree species, tree health and, climate. Thanks for the photo Keith!